The Educational and Research Hospital in Ankara is one of the oldest in Turkey and has an enviable reputation for its expertise. Hochiki fire protection equipment and Kentec fire control panels now protect the hospital, which serves patients from Ankara and the surrounding regions. The Educational and Research Hospital in Ankara is one of the oldest in Turkey and has an enviable reputation for its expertise. Hochiki fire protection equipment and Kentec fire control panels now protect the hospital, which serves patients from Ankara and the surrounding regions. With five buildings on the site including a medical building, administrative offices, polyclinics and dental and first aid treatment facilities the hospital required a fire protection system that could provide complete control throughout all its buildings. One of the important requirements for the fire alarm system project was compliance with the EN 54. Special attention was paid to parts of buildings carrying the highest risk of fire occurrence, including space above false ceilings where cables transmitting power supply and data pass. Three 4-loop Kentec Syncro panels, 1,200 Hochiki smoke detectors and 50 Hochiki CHQ modules for building automation purposes now protect the hospital. features such as moving lifts down to ground floor and keeping their doors open, activating voice evacuation systems, detecting gas leakage in kitchen and boiler room and integration with the CCTV surveillance system to monitor fire alarm locations, were all provided. This installation is the first of its kind in a large hospital to integrate the fire alarm control system with the CCTV surveillance. The fire alarm system utilises 40 CHQ-R relay modules to control 180 cameras, which monitor all parts of the hospital continuously 24 hours a day. Fire detectors installed in the same location as specific cameras were grouped and joined by cause-effect with the modules controlling the cameras. By linking the firm alarm system to the cameras in this way if the fire alarm control panel detects a fire event it activates the relevant relay module, which, in turn provides an input signal to the CCTV control panel, and asks the camera or cameras to show the fire alarm location. This feature enables the guards watching the video surveillance monitors to immediately see the site of the fire alarm without having to go to the specific location and speeds up the whole response to the fire. 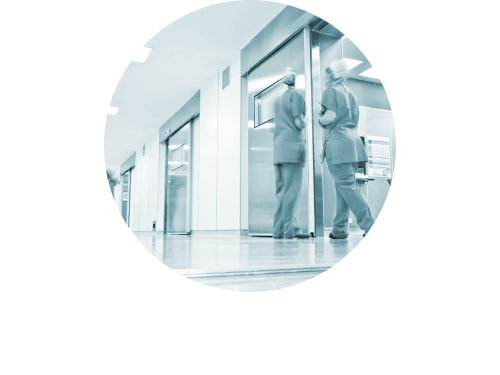 In addition the fire event local voice evacuation system warns hospital personnel and patients and directs to the correct exits.